This complex, allegorical miniature shows a rare portrayal of the Annunciation combined with the Unicorn Hunt. This work has been sold. This miniature is a rare depiction of the Annunciation that takes place in the ‘Hortus conclusus’, combined with the Unicorn Hunt. The legendary creature appears in the centre of the composition, resting in Mary’s lap while the archangel Gabriel is shown blowing a horn, as hounds chase the unicorn into the Virgin's arms, and a little Christ Child descends on rays of light from God the Father. Mary is represented in a walled garden, surrounded by a curious array of objects. To explain their symbolic significance, these are labelled with Latin titles taken from a long tradition of biblical or legendary symbols associated with Mary’s role in the Christian salvation as virgin and mother. 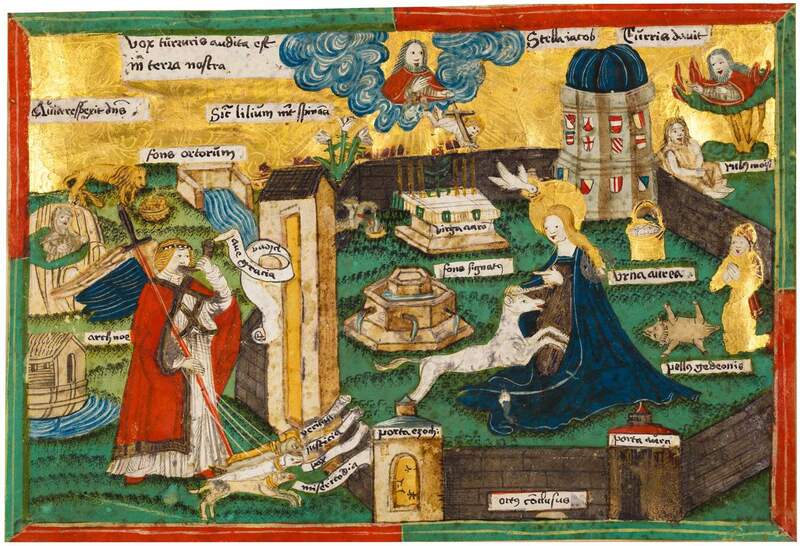 The image shows: God in heaven sending down Jesus depicted as a child carrying a Cross, the Star of Jacob in the sky, an enclosed garden incorporating the Tower of David with heraldic shields, and two gates labelled as the Golden Gate and the Gate of Ezekiel, in the garden are an altar on which the Rod of Aaron is blooming, a sealed fountain, a pot of gold, Gideon kneeling before the Golden Fleece, a Pelican in its Piety, and the Virgin Mary with the Dove of the Holy Spirit and a unicorn; outside the walls are Moses before the Burning Bush, Noah’s Ark, a lion and its cubs, a spring, lilies, and the archangel Gabriel blowing a horn and holding the leashes of four dogs identified as Truth, Justice, Peace, and Mercy. This work is now in the collection of the Morgan Library and Museum in New York.